Each year, excessive alcohol use is responsible for 88 thousand deaths in the United States. Excessive drinking is defined as binge drinking, heavy drinking, and any alcohol use by pregnant women or anyone younger than 21. Through education, The Centers for Disease Control and Prevention (CDC) is at the frontline of the nation’s efforts to prevent excessive alcohol use and deaths throughout the nation. 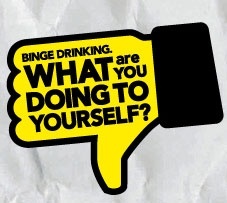 Binge drinking is defined as the consumption of an average of 8 drinks in one evening with the intent of becoming intoxicated. It is the most common form of excessive drinking. In fact, 90% of adults who are excessive drinkers binge drink, as well as 90% of the alcohol consumed by youth is done so through binge drinking. Excessive drinking can have serious effects on the individual’s health as well as the lives of those closest to them and their communities. When drinking alcohol excessively the individual is at risk of chronic conditions such as high blood pressure, various cancers, heart disease, stroke, and liver. When intoxicated there is an increased risk of sexual behaviors, which could result in unintended pregnancy, HIV infection, and other sexually transmitted diseases. Motor Vehicle accidents are often associated with individuals who drink in excesses, operating the vehicle while under the influence, often resulting in injuries and even death. Excessive alcohol abuse can also be associated with falls, drowning, homicide, suicide, intimate partner violence, and sexual assaults. Any alcohol use during pregnancy can result in Fetal alcohol spectrum disorders, harming a developing fetus, resulting in physical, behavioral, and learning problems later in life. If you or a loved one are suffering for an alcohol abuse problem and wish to receive help there are many Alcohol Treatment Facilities available to you. Each holds its own treatment philosophy, helping individuals like yourself to recovery from alcoholism and take back control of your life.